With the "Fly It On" article in Q-Talk issue 101 as a background, I want to relate some of my observations while getting check rides in another Tri-Q2 in preparation for my first flight. Please understand I'm going to describe this in "Pilot Physics" and an aerodynamicist may take exception to some of my descriptions. 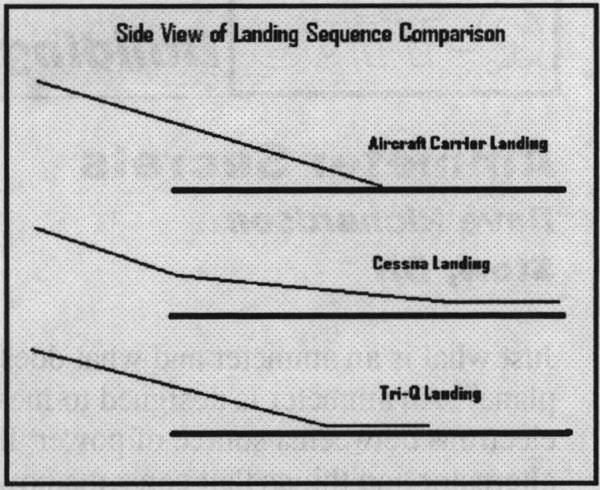 Very often the phrase "They are just different" is used with respect to the takeoffs and landings of a Q when compared to another type of plane such as a Cessna. I have to agree with that description and I hope articles such as this will help you better understand some of those differences. One very important point that I learned was those differences must be respected. When it comes time to fly your plane, I hope you will have trained to those differences and have worked with someone who has helped you become familiar with all flight characteristics, in particular, the take-off and landings before you attempt your first flight. Just reading about it is not enough. The Tri-Q is not as likely to "levitate" off the ground compared to the Q2xx's, primarily because the Tri-Q has a much lower angle of attack when on the ground roll. That implies a rotation is needed at some point to get the Tri-Q aiiborne. The Tri-Q's main gear is aft of the CG, which means the plane is heavier forward of the mains. Therefore, some force is required to get the nose up for the rotation. When there is enough speed for the elevator to become effective, it will be the primary control used for the rotation. Beyond the elevator, though, two other aspects help control how much force is needed to rotate. Reflexing the ailerons up results in pushing the tail down when going fast enough for the wing to become effective. In the Tri-Q first flight documentation, Scott Swing suggests '/" up reflexor to help take the weight off the nose wheel and assist in rotation. A passenger is another 'force' that will reduce the weight on the nose gear and assist with rotation because they tend to move the CG aft in the envelope. Consequently, flying solo may require more reflexor than when you are flying with someone. If you find yourself barreling down the runway, well above your expected stall speed and the nose feels like it is planted on the runway, it is very likely you need to add some up reflexor. Aborting the takeoff and starting over again with more up reflexor would be advisable. If you have some up reflexor but less than the optimal amount, you may find that you can pull the nose off the ground with significant elevator back force but who wants to work that hard especially on your first flight. your gear installation to maintain a straight heading down the runway. At some point, about 50-60 mph, the wing and canard will start to become effective and the nose will start getting lighter. As you get closer to and beyond the stall speed, it is very likely that the nose gear will start rising off and lowering onto the runway. The plane is actually pitch-bucking down the runway because the speed is not sufficient enough to get aiiborne and the angle of attack is too low for the current speed. The most important things you can do at this point are 1) apply back pressure on the stick to increase the angle of attack to help raise the nose and 2) note the readings on the airspeed indicator. The airspeed reading will help you later estimate the pitch buck speed in the air. When the nose wheel comes off the ground, you ease forward on the stick just enough to keep the nose wheel barely above the runaway to arrest the rotation. The plane will take off when you have reached a high enough speed. The reason for just holding the nose gear off the runway is fairly simple. On the ground, the back stick pressure essentially pushes the mains against the runway as the plane rotates around the mains. In the air, the mains lose the back pressure from the runway causing the nose to rotate up even more because in the air the plane is rotating around the CG. Since you are actually forcing the plane off the ground before the typical climb airspeed is reached and you are extremely close to the stall speed of the aircraft (Vs), you need to lower the nose some to compensate for the tendency to over-rotate. You will also pick up airspeed by pushing forward on the stick once you are in the air to begin flying parallel to the runway until you reach climb speed. This procedure is similar to what I learned to do for a soft field takeoff where you try to avoid burying your nose gear in the mushy runway. If flying solo, the plane is going to have the tendency to roll toward the pilot's side when you break ground because of uneven side to side loading. When flying with a passenger, this should be less noticeable because the weight is more evenly distributed. After several flights in Q's at Ottawa, Mattoon, Sullivan and other fly-ins, I have found that the general flight characteristics of these planes are fairly normal and they respond as expected. There are a few things to be aware of, though. The direct push-pull tube system used for the elevator and ailerons make the controls very responsive in those two axis. Since there is very little of the slop as found in the cable-pulley systems used in many spam cans, you soon learn that a little input goes a long way, especially when it comes to the elevator. Begin with small inputs until you get the feel for how much is enough. You will also notice that power changes will generally require some rudder input to stay coordinated. One very important number to know when landing your Tri-Q is your pitch-buck speed. For your first flight, many experienced pilots suggest that you determine the approximate stall speed of your plane. Leave the investigation of the exact stall speed to subsequent flights. If, for example, you anticipate a stall speed of 65 mph, going to 68 mph or so will let you know you are in the ball paik. This, along with the airspeed as you took off, will give you a good idea of what your Vs will be for this flight and at this weight. Once you have this number, multiply it by 1.3 to calculate 130% of your stall speed or Vref. Vref is the speed to be established on your final approach. This will give you a reasonable buffer above the pitch buck speed. For example, if your pitch buck happens at 65 mph, then 65 x 1.3 = 84.5 mph. Prior to turning downwind to base, look back at the end of the runway. Extend an imaginary ribbon to visualize the path you will be taking to reach the runway from your current position. This will help you approximate how steep your descent needs to be as well as your throttle changes to get on the glide slope. If your downwind to base turn is fairly close to the approach end of the runway and you are at traffic pattern altitude, you will need a steep dive, chop your power and possibly deploy the belly board to quickly get rid of excess altitude. If your downwind leg is extended, then the descent angle will be fairly shallow and your power reduction will also be less in comparison to a tight base turn. On final you will establish yourself on the glide slope, adjust your pitch to maintain the Vref (Vs x 1.3) and control your rate of descent with your throttle. Many people use and recommend a 500 fpm descent when landing, dropping about 8.3 feet per second. Choose a point on the approach end of the runway and note the relative distance above the cowling to that point. Use this spot as your aim point. 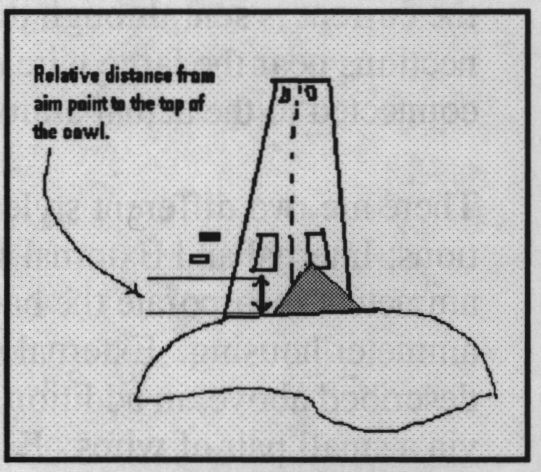 By maintaining that aim point in the same relative height above the cowling, you will find where your glide slope will intersect the runway. This is the same technique used to determine if another plane is on a collision course with you. You will notice the other plane is getting larger but not moving, relative to a spot on your windshield. The important scan to use at this point is speed, ball and aim point, meaning you are on your Vref speed, the ball is centered and the position of the aim point remains the same, relative to the top of the cowl. Here is where things get interesting... As discussed in the "Fly It On" article in Q-Talk issue 101, a single stage roundout is needed instead of the two stage flair often used in a standard Cessna. By two stage, I mean where you raise the nose some after you get over the end of the runway in stage one and raise the nose again once you get within a few feet of the runway. Recall part of the reason for the two stages relates to the fact that the flaps on a Cessna let you fly with your nose lower than your tail for greater visibility without gaining speed. The two stages help you position the nose gear and propeller out of the way for landing. There are several reasons why a single stage roundout is used with your Tri-Q. By establishing your approach speed at Vref, or Vsx 1.3, your nose will already be higher than your tail. Eliminating the first stage means you maintain your descent to the aim point until you are just a few feet off the runway and maintain that airspeed buffer above your pitch buck speed as long as possible. Raising the nose as you get closer to the pitch buck speed will tend to reduce your ability to see over the nose of the Tri-Q. By waiting to raise the nose until you are just above your aim point on the runway will give you the most amount of time to see the runway and be lined up for a good landing. Raising the nose too soon and too high reduces your speed, taking away from your buffer above your stall speed and reduces your visibility over the nose. The important scan at this point is speed, wings level and aligned with the runway. When you are within a few feet of the aim point on the runway, you raise the nose to begin flying level with the runway. You should be able to see the other end of the runway at this point to help with alignment. The increase in pitch will cause a decrease in speed. It is important to include the airspeed in your scan to be sure you are above the stall speed of the airplane. Slowly raise the nose of the plane again while slowly reducing the throttle to idle. The visibility over the nose is eliminated at this point and you will need to look out over the canard and along the side of the cowling for your ground reference. This will place you a few feet off the ground at about Vs x 1.1 - 1.2. It is important that you maintain your speed above the Vs or you will begin pitch bucking. I was shown a technique called "Milking" to help the plane settle onto the ground. Milking involves very slight forward stick movements. This is done by opening your grip on the stick just a little, where you can hardly see the stick moving and then bringing it back to where you started again. This will help you stair step down to the runway and maintain control of your airspeed. You will be "feeling" for the runway using this technique. Once the mains are on the runway, many Tri-Q drivers will hold the nose off for as long as possible to get past the light-nose bouncing phase described in the takeoff sequence. Ok that's the circuit. Is this the only way you can land a Tri-Q2? Probably not. Are the example speeds what you would expect in a Tri-Q200? Probably not. This is a description of how I'm training to fly my Tri-Q2. You really need to get to this level of description before you fly your Tri-Q to be able to feel comfortable with the takeoff and landing sequences. This will help eliminate some of the concern in your mind when you take to the sky.